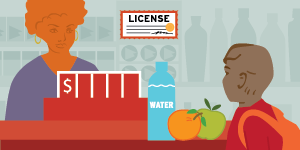 Check out our newest resources, available as Healthy Retail: A Set of Tools for Policy and Partnership. Make stores healthier by addressing tobacco, nutrition, and alcohol all at once. Government agencies can collaborate and develop a comprehensive approach to improving the retail environment. Do you want to create healthier stores in your community? We have brought together materials from every corner of our library to help you. See what healthy stores can look like and learn why they’re important. And check out our resources to learn more about creating access to healthy foods, limiting tobacco marketing, and keeping alcohol stores away from schools. At ChangeLab Solutions, we think it’s important to take a comprehensive approach to improving the retail environment. When public health practitioners in different agencies—such as tobacco control, nutrition, and excessive alcohol use prevention—work together, they can help create stores where it’s easy to make healthier choices. Contact us to start building a healthy retail initiative for your community.